It has been said that every member of the Baby Boomer Generation recalls where they were when they heard the news in 1963 that President JFK had been shot. 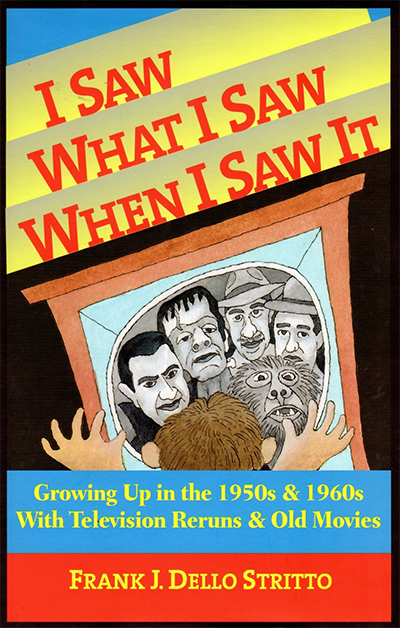 In his new book, I Saw What I Saw When I Saw It, writer Frank Dello Stritto makes the contention quite clear that most in our Monster-Boom Generation know where they were and in what stage of development their life was when they discovered horror and sci-fi. In a unique blend of autobiography and film commentary, Mr. Dello J. Stritto unfolds his own unique discovery of our favorite film genre in a way to which every film fan may relate. The development of motion pictures, radio and television—how each evolved and held influence over the other media—that is one focus of this book. 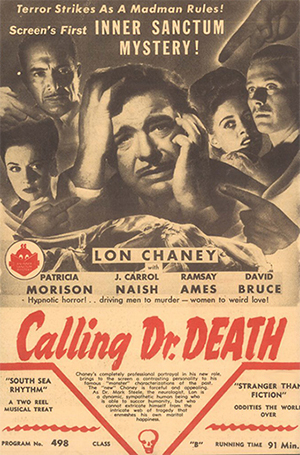 How the post cinema mythology was unveiled randomly on TV in the 1950s and 60s to a young generation of viewers, and particularly the impact it had on family life, and later career decisions. These are the base of a second connecting thread running through this book. A third element is, as the title suggests, the value of Abbott & Costello Meet Frankenstein; how that production united several generations of film fans, interweaving comedy and monsters more seamlessly than ever before. I was one who saw this classic early on, in a TV showing. I then worked backwards to discover the Universal horrors and the Golden Age of Comedy, i.e., Chaplin, Keaton, Laurel & Hardy and so on; mostly on TV and mostly because of A&C Meet Frank. Some people have declared that films were the greatest new art form of the 20th Century, since it absorbed all pervious art forms: acting; writing; music; photography; use of color; costume design and so much more. How each of us discovered the cinema, learned to love certain aspects of the entertainment business more than others—that became a very personal journey we each took once the fascination took hold. And no two journeys are alike. In the 1990s, I was publishing Cult Movies magazine, a 10 year series covering films other magazines chose not to investigate. Two of our most popular film critics were Frank Dello Stritto and Kathy Orrison. A film fan since childhood, Ms. Orrison worked in a variety of departments of film design and production. In an illuminating interview I conducted with her, Kathy laments a serious gap in her early 1960s film knowledge, since she was too young to go to the theater by herself, but not too young to work the dials on the TV set. Many film lovers can relate to such a fate. That was not, however, Frank’s fate! Many towns, big and small, had grindhouse theaters and eventually drive-ins. Frank mentions the Lincoln Theater in his hometown, with such fondness and frequency, that the theater becomes a living, and friendly companion of his childhood days. He outlines the Saturday matinees, the booking patterns and how those films most loved by the neighborhood kids, got brought back with some rapidity by the management. From the Inner Sanctum Mysteries onward, I’ve always been impressed with Chaney, Jr., as a sincere and effective actor. Frank does not seem to enjoy the Inner Sanctum, but devotes many pages to Chaney, with love, introspection and on-target critiques of the man’s talent as star or character player in monster films as well as Westerns. In Cult Movies, Buddy Barnett and I, along with Forry Ackerman in Famous Monsters, often found that film fans evolved fort one reason: Bela Lugosi. Frank does well holding that torch high, by devoting entire chapters to Lugosi insights, be it Black Camel, Island of Lost Souls, the several Chandu films—or Dracula. Frank also has high regard for shows made for TV such as Twilight Zone, and also expresses opinions on some programs fading into the dust of time such as One Step Beyond and Science Fiction Theater. All good stuff. There’s so much more, way too much to critique in this brief review. All I can say is it’s the only 400 page book I wanted to never end. I wished it would go on and on, I was that enthralled. My best suggestion is that you read the book and see if you don’t agree. Although it is part autobiography—or perhaps because of it—the book will take you back to your own childhood and that moment when you discovered the greats of the screen for the first time. Kudos too, to Tom Jackson, who designed the entire book and cover art. And to artistic genius of Jary Lesser, who rendered dozens of iconic artworks from the films, each etched in a distinct and pleasing style; worthy of a book of their own. All this combines to make Frank’s new book a very handsome volume, indeed. For more information, contact Frank J. Dello Stritto.